When you work at home, you gain a lot of nice benefits—you even lose your commute. But as reviled as the extra hours we spend in the car or on public transportation can be, without them, you lose time to catch up on Twitter, your latest book, podcast, or NPR. And if it’s your daily news dose you’re missing, Hourly News 1.1 (Mac App Store link) is a great way to get it. 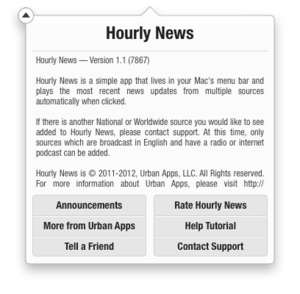 Hourly News installs in your menu bar as an unassuming playhead; click it, and the app automatically loads NPR’s latest five minute hourly news update. Also available are the BBC News Summary, CBC Hourly Edition, Fox’s 5 Minute Newscast, the WSJ Hourly Report, Voice of America Newscast, ESPN SportsCenter, SRN Hourly News, Bloomberg Market Minute, DW Radio News, RTHK News Bulletin, and Evening Edition’s audio podcast. Select multiple sources, and Hourly News will play them back to back whenever you press play. To pause the broadcast, just click the menulet; to access its settings, hover over the icon until a drop-down appears. I love Hourly News’s simplicity and easy access—too many times I’ll collect podcast episodes without ever listening to them, but the app provides an easy incentive for listening while on a tea break or washing dishes. It’s the perfect addition to a news junkie’s computer. The app occasionally resets the stream mid-play, which can be annoying, but it’s easy enough to scrub to the proper point in the playlist—or simply replay the broadcast over. 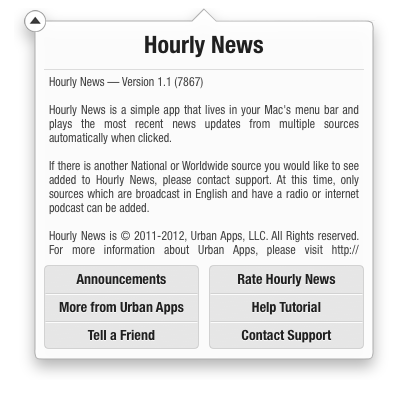 Hourly News puts news broadcasts and podcasts within a simple click of the mouse.